LIVE from #HIMSS16: Broadcast Schedule | It's all about the triple aim. As is typical for many I suspect the planning process to get ready for HiMSS16 is somewhat of a ‘last minute’ and rather challenging affair. When and if the planets actually align, there is a sense of order out of the chaos that reveals itself. Today, Friday February 26th, 2016 that order seems to be congealing. 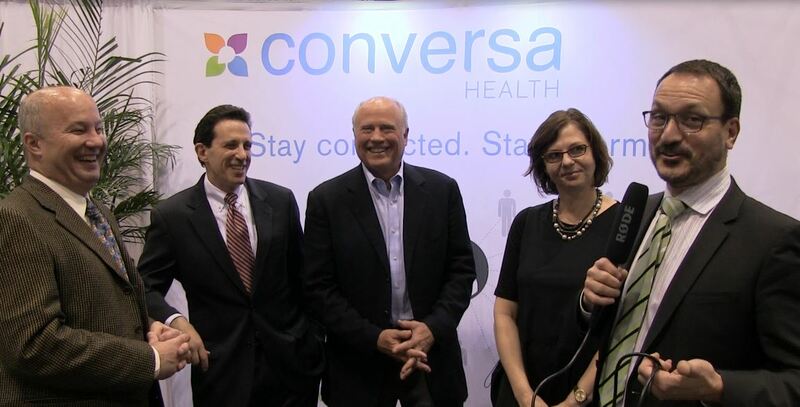 We are broadcasting LIVE from #HIMSS16 on This Week in Health Innovation from the Conversa Health Booth (#11334) from 11AM – 1PM Tuesday, Wednesday and Thursday. Our on air hosts include: Phil Marshall, MD, (@PhilMarshallMD), Chief Product Officer, Conversa Health, and my co-host on This Week in Health Innovation, Douglas Goldstein (@eFuturist) Co-host, Health Innovation Media, and Advisor to the Inova Center for Personalized Health (@InovaCPH), and Fred Goldstein (@fsgoldstein) President, Accountable Health, LLC, and Co-host, Health Innovation Media and co-founder PopHealth Week @PopHealthWeek. PROGRAM NOTE: as produced we are hyper-linking audio only versions of the interviews. If name is hyperlinked, this will take you direct to the recorded interview. The video versions will be parsed out over the next several weeks. 11:45: Patrick Soon-Shiong, MD (@DrPatSoonShiong), Founder, Nant Health, LLC (@NantHealth) and Driver of Cancer Moonshot 2020, (@MoonShot2020). See: WEF Cancer Moonshot and JP Morgan Healthcare Conference. 11AM: Mark Scrimshire (@ekivemark), Entrepreneur-In-Residence, CMS & Founder, HealthCamp. 11:15: Mario Englada (@angladam), Vice President, Healthcare, Univision (@Univision). As we all know, ‘shift happens‘ especially when 42k+ peeps collide at an event of HiMSS’s scale, so we expect some real time schedule adjustments due to late arrivals, over-runs and outright ‘oops’ moments, i.e., ‘I [or my handlers] forgot’. We’ll flex with the experience and may have some time for ad hoc interviews. So you may want to hover around the booth during broadcast schedule in the event any slots open! PR reps take note: We’ll be ‘periscoping‘ and live tweeting during each session and will have our cameras trained on the event for simulcast video recording of the broadcast. In addition several guests will be invited to sit for a 10 minute video interview to stream via PrecisionMedicine.Center, ACOwatch, CMIOchat, PopHealth Week or Health Innovation Media video library, as thematically appropriate. We welcome your support and contribution to the #HiMSS16 digital footprint! …what happens in Vegas stays on Twitter, Facebook, Instragram and Youtube! Previous Post Previous post: Context is King. Without It. We’re Just Templates!